Multimasking : What is it ? Multimasking involves simultaneously applying several masks to different areas of the face, assuming that each area of ​​the face has its specific needs. Practiced for decades by the Japanese, this treatment is particularly recommended by dermatologists. Learn to listen, to watch, to feel your skin: Shine on the T-zone, imperfections on the bottom of the cheeks and chin, sensitive cheeks, lack of localized radiance, dehydration zones, the list of specific needs is long and varied . The skin can also change depending on the periods of your life, moments of stress, weather conditions ... Listen and feel your skin and it will make you feel good. Shine on the T-zone, imperfections on the bottom of the cheeks and the chin, sensitive cheeks, lack of localized radiance, dehydration zones, the list of specific needs is long and varied! By choosing masks adapted to the needs of the skin, the quality of it will improve significantly, the complexion will be more homogeneous, more radiant. Multimasking can fight against pollution, tobacco, stress, the first signs of aging, factors that can make your skin dull and lack of radiance. The dull complexion is recognized by its gray color, its areas chiaroscuro and lack of homogeneity of the skin-the latter systematically preventing the makeup from adhering. One of the most important solutions is to make scrubs regularly. Many women have mixed skin, that is to say a skin where the excess of sebum, the imperfections concentrate on this famous zone T (Front, Nose, chin) whereas the other parts of the face can be of normal type sensitive or even dry. In some cases, excess sebum (and therefore shine) is concentrated on the nose, chin and lower cheeks. This is called an inverted T zone. These tips are obviously to adapt to your own needs, so you play, you mix! Some areas of the face require special attention because they are more prone to drying, irritation, dehydration. This is the case of the cheeks, wings of the nose and contour of the lips. 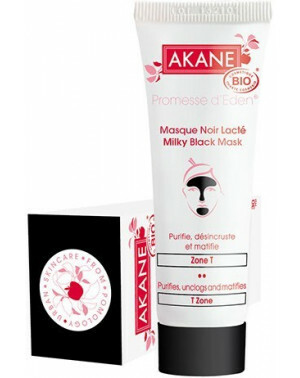 The Akane White Mask is enriched with organic rice powder and vegetable betaine with hydrating and soothing power. It can be used alone for sensitive skin in duo or trio with the Black Milky Mask and the Pink Granite Mask. The Milky Black Mask purifies, unclogs and matifies. Its unique formula cleanses, unclogs and regulates the excess of sebum.Perfectly clean, your skin is soft and without shine! 100% natural origin formula. This mask brings softness and hydration to the skin. Its unique formula moisturizes, soothes and reduces the redness of skin and sensitive areas. Your skin is protected, soft as silk. 100% natural origin formula.